What did it take to make this week's frozen cover? 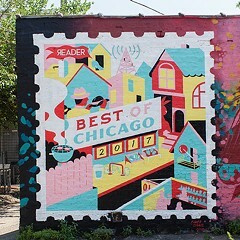 A big freezer, baking dishes full of water, two giant boxes of cherry and strawberry Jell-O, filters, razors, a hammer, an old window, and whatever we could find in a cold basement. And a few weeks of trial and error. 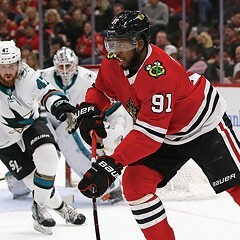 Related Black hockey players excel on ice despite history of racism, lack of rinks in Chicago: A dearth of ice rinks and long history of racial tension have hampered efforts to diversify hockey’s ranks—but that’s changing. We wanted to illustrate Evan F. Moore's story about racism in hockey—and efforts to change the game and diversify the sport—in a more impactful way. 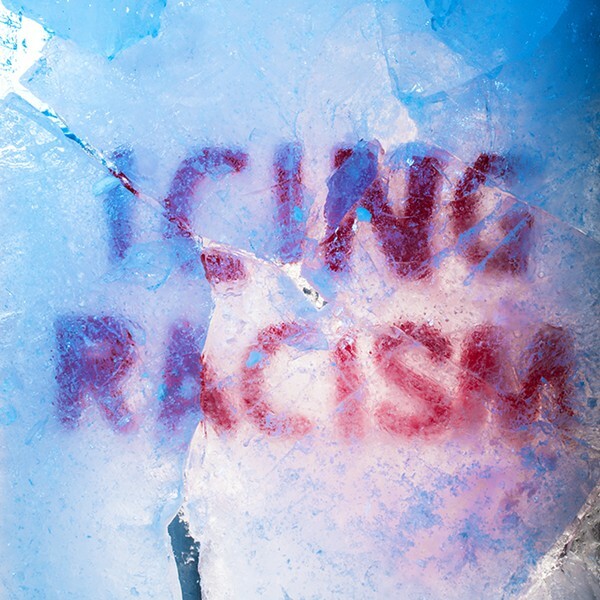 We tried shooting a picture of the headline through a clear block of ice, but that didn't quite cut it. So we decided to make the headline ourselves. We first took some letter-shaped silicone molds and made ice using water and food coloring. 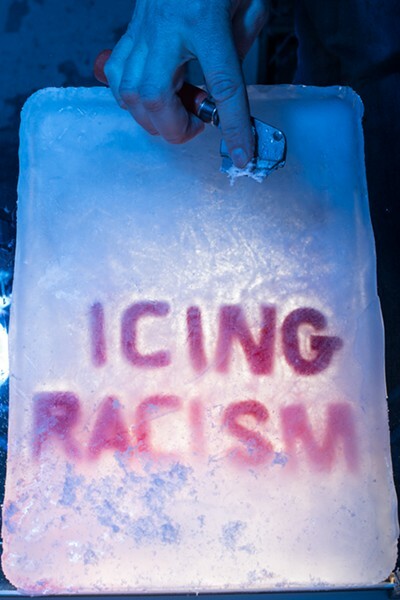 But when we tried to freeze those letters inside a larger block of ice in a baking pan, the coloring bled. A friend suggested we try Jell-O in the molds. These worked much better. Those kept their color when frozen in the larger block of ice, but they would move if we completely submerged them. This resulted in many botched ice blocks. As you can see in one of the pictures below, the G had floated out of place while freezing. So we poured water partway up the side of the letters, froze them in place, then poured more water on top and froze them again. 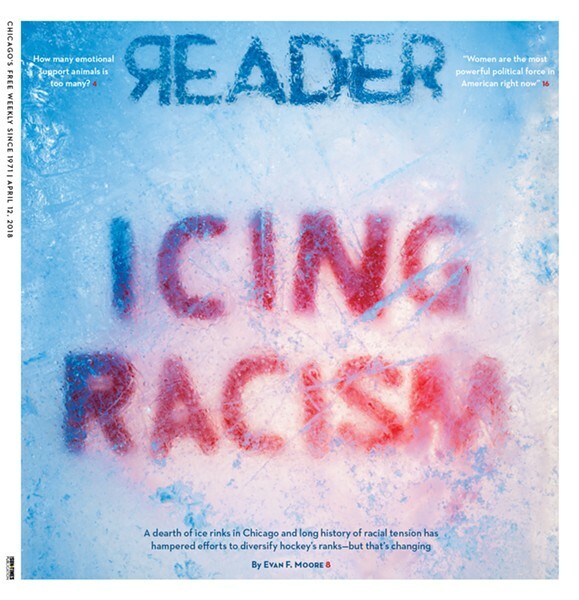 Once we got a solid block of ice with the letters positioned how we wanted them, we set up a "studio" in the basement of the home of Reader creative director Vince Cerasani—and used random stuff from Vince's basement to support everything. Then director of photography Jamie Ramsay took a ton of photos. The ice block is propped on an old wooden window frame, which is supported by two folding chairs. 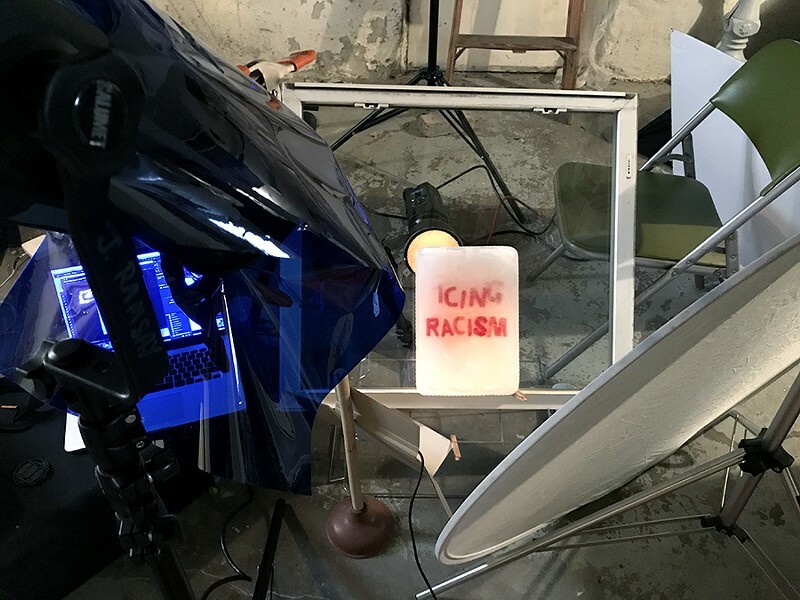 In the upper left of this picture is a studio light with a blue gel, or filter, to color the light being projecting onto the ice block and give it a blue hue. There is another light behind the block of ice. To the right is a round screen that reflects the light back onto the ice block. A toilet plunger is supporting yet another reflector. Why do this in a basement? 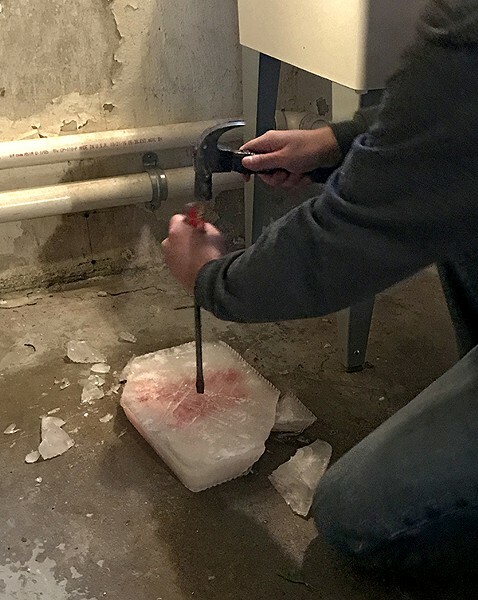 So we could take advantage of a drain—and the really cold temperatures in Vince's basement kept the ice solid for a couple hours to shoot the photos—much longer than we thought. This block of ice above was used on our inside pages (right). We cracked it with a hammer and screwdriver before we put the pieces back together to shoot the photo. Vince (above) takes a razor to the ice block to simulate skate marks you can see on the cover. 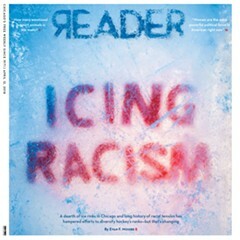 The Reader logo on the cover was shot through the clear block of ice. That image was photoshopped together with the homemade block of ice. Here is the block of ice melting again—this is a time-lapse video taken overnight.